September is the time for the third, final, and most important fertilization of the year. Put organic fertilizer down at the rate of 20 pounds per 1,000 square feet on lawns and all flower/shrub beds. If you can only afford to do one fertilization a year, this is the one to do. Water well after applying fertilizers. ORGANIC: If you want to use the organic version of “weed and feed,” use Corn GLUTEN Meal in your lawn areas. CGM is also a very good fertilizer, so if you go this route, you do not need to use additional fertilizer for your lawn (you will need organic fertilizer for your shrub/flower beds, though). Corn gluten meal goes down at the rate of 20 pounds per 1,000 square feet, as well. Using the powder form of CGM is more effective than the granular, spreadable kind. Try to apply on a non-windy day. Do not put corn gluten meal in any flower beds where you want seeds to germinate. NOTE: Excessive moisture can reduce the effectiveness of CGM, so it is best to apply it when there is no rain forecast for a few days. Apply, water it in lightly, then do not water again for several days. Click here for more info on CGM. SYNTHETIC: This is a departure from my normal advice to practice organic gardening, but I just wanted to give you the information and let you determine what is the best course of action for your lawn care. As mentioned above, synthetic pre-emergents MUST be applied during the last week of August or first week of September (per Neil Sperry's latest recommendations) in order to be effective against spring weeds. Follow product labels as directed for application rates. For spring GRASSY WEEDS such as Poa annua (annual bluegrass), apply Scotts Halts or Dimension. The label will say "crabgrass preventer," but don't let that confuse you. Just pretend it says "grassy weed preventer." Crabgrass is a summer grassy weed, so this same product can be used in the spring to prevent germination of crabgrass (I will address in the spring newsletter). For spring BROADLEAF WEEDS such as henbit (purple bloom), chickweed (white bloom), dandelions, and clover, apply a Gallery herbicide (Ferti-Lome is one brand). Both products can be applied on the same day, but it is recommended that you do not mix the granular products together before applying. Water only lightly after applying. I would caution you to NOT use chemical "weed-and-feed" products. Read product labels. The herbicides in weed-and-feed products can damage shade trees. Fall is THE BEST time for planting trees, shrubs, and perennials. Even though the upper part of the tree, shrub, or perennial may be dormant during the winter, the roots will continue to develop throughout the winter, and your plants will be very well established before next summer’s heat. Nurseries usually have great sales going on this time of year, too! Fall is also a great time to transplant shrubs and divide and transplant perennials, if needed. Make sure the soil/root ball is very moist when planting, and keep soil moist until the plant is established. If you need to transplant a tree, wait until it is completely dormant, usually January. Before you plant or transplant anything (except trees – see instructions below), be sure to prepare the beds with lots of compost. Add the compost and till it in with a tiller or just a shovel. If you have heavy clay soil, till in expanded shale, as well. Planting Trees: When planting trees, never add anything to the planting hole except the soil that came out of the hole. Amending the planting hole basically creates a "container" in the ground. The tree roots may not want to move beyond the nice cushy soil of the "container," and when the roots hit the native soil, they may circle back, eventually girdling the tree. NOTE: If you are planting a Shumard Red Oak or Chinese Pistachio, you will need to wrap the trunk with tree wrap (see picture below) for two years to prevent sun scald and borer attack. Herbs and Vegetables: Fall is a great time to plant cool-season herbs and vegetables: cabbage, broccoli, cauliflower, carrots, beets, beans, spinach, leaf lettuce, radish, parsley, cilantro. Plant garlic cloves in October. Click here for complete vegetable planting guide for North Texas. Bulbs: Plant bulbs in a hole 3 times the height of the bulb. Daffodils, do not need pre-chilling and can be planted anytime after October 1st and through mid-January. Several good varieties of daffodils are: Ice Follies, Tete-a-Tete (my new favorite! ), Carlton, Fortune, Golden Dawn, and Grand Primo. Also try Spanish bluebells, Byzantine gladiolus, Summer Snowflake (Leucojum), species tulips, petticoats, fall crocus, and red spider lilies (Lycoris radiata), Oxblood lilies (Rhodophiala bifida). Tulips, Hyacinth, and Crocus need to be pre-chilled prior to planting. To pre-chill bulbs, store the bulbs in the refrigerator at 45°F for 45 to 60 days; then plant in late December, early January, when soil temperatures reach 45-50°F. Annuals and Containers: It's still a little bit early for planting pansies and other winter color. Wait until it is consistently cooler (75 degrees-October/ November) to plant winter color. If your spring/summer annuals in beds and containers are either totally fried or at least a little tired looking and you want to add a little color now, try crotons for foliage color, and petunias, marigolds, or garden mums for blooms. It is best to buy plants in bud, not full bloom. For late fall/winter annual color, plant: pansies/violas, dianthus, dusty miller, cabbage/kale, and curly parsley. They can handle pretty much anything our Texas winters dish out. Other color options are: snapdragons, alyssum, cyclamen, mustard, and Swiss chard, but they may need to be covered and protected if a hard freeze is expected. Pansies are susceptible to a soil-borne disease if the soil is too warm, and they can die very quickly, so be sure to wait until it cools down. 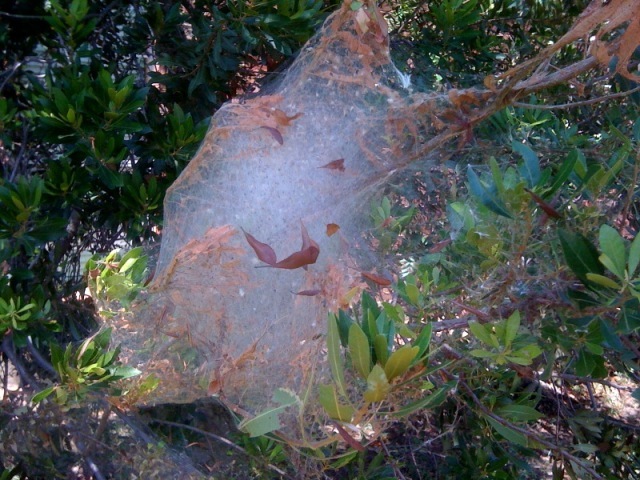 Fall Webworms: If you notice webs forming in some of your trees, especially pecan and mulberry trees, those webs are formed by fall webworms. There are two to four generations of webworms each year. They will usually just do cosmetic damage to a tree but will not kill it. Just take a long-handled pole or rake and break the webs open. The birds and wasps will take care of the worms. You can also spray with a product called Bt (Bacillus thuringiensis), but you will need to break the webs open first so that the Bt can penetrate the web. Bt will kill all caterpillars, whether webworm caterpillars or monarch butterfly caterpillars, so use it selectively. Bt can be obtained from any garden center. Use as directed by the label. 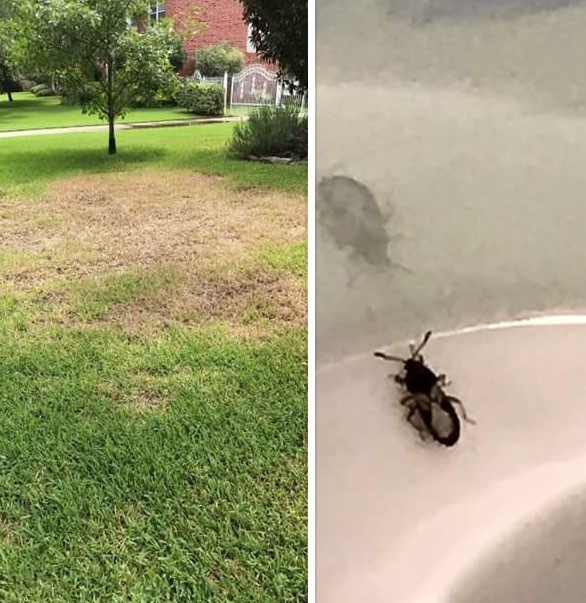 Chinch Bugs: Do you have a patch of St. Augustine lawn that started looking like this in the middle of the summer? 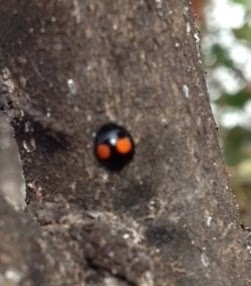 (see picture below) The culprit is most likely chinch bugs. They usually show up in the hottest, driest spot in your lawn. Get down on your hands and knees in the green section of the lawn bordering the browned areas and look for these tiny bugs scurrying through the grass (again, see picture below). Treat with an insecticide labeled for chinch bugs (follow the label directions in applying). Early next summer keep an eye out for any signs of chinch bug damage beginning and treat at the first sign of damage. Crape Myrtle Bark Scale: Crape Myrtle bark scales are aggressive, sap-feeding insects that appear as white, waxy encrustations most likely to occur near pruning wounds or in branch crotches. Larger female scales "bleed" a pink liquid when crushed. Click here for a video showing recommended treatments and how to apply. Aphids: Just blast them with a strong spray of water. Rose Rosette Disease: For the few who still have roses in your garden, be on the lookout for symptoms of Rose Rosette Disease, which present as red, distorted new growth (known as "witches' broom") on long, thickened stems with excessive growth of thorns along the stem. This disease is transmitted by a microscopic eriophyid mite and is spread to other roses as the mite travels on wind currents. At this point in time there is no effective control of the disease, and it is recommended that any roses with Rose Rosette Disease be completely removed and destroyed, roots and all. Click here to learn more. Most cities in our area remain under mandatory water restrictions, despite any recent rains. Watering is limited to twice a week between the hours of 6 p.m. and 10 a.m. Twice-a-week watering should be sufficient for most landscapes (and even less for true xeriscaped gardens). Watering more frequently develops shallow root systems and just sets your landscape up for failure when water restrictions are enforced. I suggest using the "cycle and soak" method. Run all zones of your sprinkler system, wait 15 to 30 minutes, and then repeat the cycle again. This gives the first run cycle time to soak in before it runs again. This requires either a Program A and B or multiple start times on your controller. Mulch, mulch, mulch!!! Mulching all bare soil conserves moisture, helps moderate soil temps, and helps keep the weeds to a minimum. I prefer native cedar mulch, but any mulch is better than nothing. Please don’t skimp on mulching; it is so important. Be careful that you don’t pile mulch up on the trunks of trees or shrubs. Until the grass goes dormant, continue to mow regularly, cutting no more than one-third of the grass height per mowing. As it cools down this fall you may see fungal problems appearing in your St. Augustine or Bermuda lawns. Spread ½ inch layer of compost over the area. If you need to add sod to your yard, plant it early to mid-September to give the roots time to develop before winter freezes. Water new sod daily for 10 minutes for about 2 weeks to get it to root in; then resume normal watering schedule. As the leaves start to fall, just mow them and leave the clippings on your lawn. If you have an abundance of leaves, you can rake them up and throw them in the compost pile. Adding cotton seed meal and some water to the pile of leaves will turn them into rich compost quickly. Trees: If you need to prune your trees, winter is the best time to do that while the trees are dormant. Also, it is best to prune oak trees during winter months to avoid the spread of oak wilt disease. Shrubs: All major pruning of shrubs should be done in mid-February. Mark your calendars now so you remember to do major pruning in February (pruning details are in my Spring Newsletter.) If you need to prune now, prune selectively and lightly. Shrubs that were hard pruned in the spring, like Burford and Dwarf Yaupon Hollies, may be sending off erratic new growth right now. Go ahead and trim that erratic growth now to keep a tidy shape. PERENNIALS: If you have a question about a specific perennial, just let me know. The following are just a few tips. Continue deadheading blooming perennials until we have a hard freeze. Fall is like a second spring with all of the fall blooming perennials. Some great fall blooming perennials are: Mexican Bush Sage, Fall Aster, Salvia Greggii, Chrysanthemum, Mexican Mint Marigold, Turk’s Cap, Copper Canyon Daisy. Purple Coneflower, Black-Eyed Susan, Shasta and Ox-eye Daisy -- Prune spent flower stalks to the ground. Salvia Greggii – Give it a slight haircut if blooming has slowed, trimming 3 to 6 inches. This is a prolific fall bloomer!! Save heavy pruning for February. Salvia leucantha (Mexican Bush Sage) – Fall bloomer. After a hard freeze, cut down to the ground, then mulch. Mexican Mint Marigold – same instructions as Mexican Bush Sage. Aster oblongifolius (Fall Aster) – You can cut to ground after a freeze, or wait until mid-February for winter texture and interest. Chrysanthemums – same instructions as Mexican Bush Sage. Salvia farinacea (mealycup sage), Salvia guaranitica – If blooms are faded and plants are leggy, cut down to about a foot tall; they will rebloom in a few weeks. After a hard freeze, you can cut down to the ground. Russian Sage – After a hard freeze, cut down to the ground. Purple Heart - after a hard freeze, cut to the ground. Canna - right before a hard freeze, cut to the ground. You can wait till after the freeze, but stems will be mushy and messy. Hardy Hibiscus - After freeze, cut stems to the ground, then mulch. Blackfoot Daisy, Calylophus, Pink Skullcap, Dianthus, 4-nerve Daisy - No need to prune. Ornamental grasses - After a hard freeze, the grasses will turn tan, but just leave them alone until February. The grasses add texture and interest in your garden during the winter. Columbine - They should start putting on new growth as the weather turns cooler. They will be evergreen through the winter and will bloom in the spring. Powis Castle Artemisia - Wait until February to cut it back. Datura, Turk's Cap - Cut to ground after hard freeze. Ferns - Holly Ferns and Autumn Ferns are evergreen – don’t cut back. Wood Ferns and Japanese Painted Ferns will turn brown after a freeze. Cut them to the ground and mulch. Summer Phlox - Right below fading blooms, you might see new leaves forming. Trim right above those new leaves and it should bloom again. After freeze, cut to ground. Hydrangeas - Do not prune. The only time to prune is immediately after they finish blooming. Pruning now or in the spring will sacrifice next year's bloom. Rosemary - Trim back in September by 1/3 to stimulate new growth and winter blooms. Evergreen Herbs (Thyme, Oregano, Winter Savory, Salad Burnet) - Trim back in the fall, if desired, to produce new growth. Roses - Ideally, shrub roses should have been pruned by one-third in August, but if you have not already pruned them, do so very early in September; then fertilize and mulch. They will put on new growth and will bloom again in October. Easy Gardens for North Central Texas by Steve Huddleston and Pamela Crawford.